My wife and I attended a writing workshop led by Wisconsin author Jerry Apps this past weekend. The focus of the workshop was for attendees to revisit their personal history and learn how to turn those memories into a working document. Jerry said we wouldn’t be covering the publishing end of things – and he could easily spend three days just on that aspect of writing – but that was fine because his knowledge on writing a personal story easily filled the three-hour workshop. 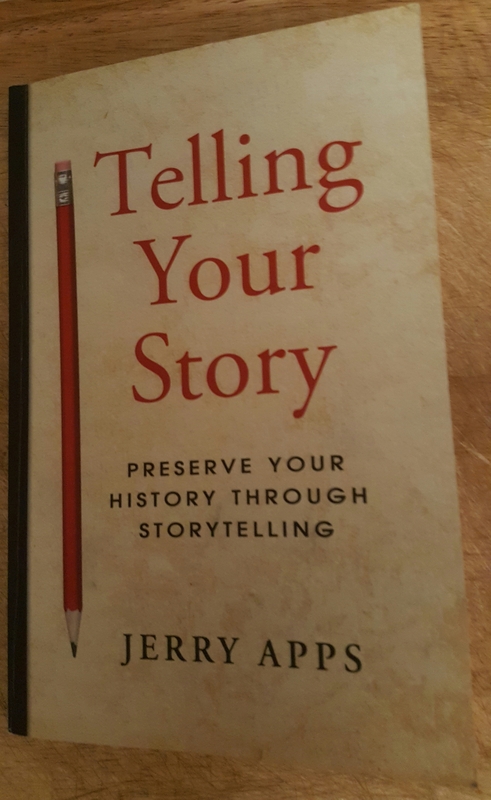 Jerry used his book “Telling Your Story” as a guide for the workshop. I started reading the book around the holidays and have already found a lot of excellent tips. I’m not going to give away the whole format for the workshop, but want to touch on an effective exercise we did. Jerry gave us a sheet of paper and asked that we draw the layout of the house we lived in around age 10-12, complete with people in the rooms. After a break, we followed up that exercise by writing a story about one of the rooms in the house and something that happened there. It was what Jerry calls a “timed writing” exercise because we were only given fifteen minutes. One thing he advocates is writing without getting hung up on spelling, punctuation, finding the perfect word, and so on. Personally, I go by this rule too and often say to “write fast and edit slow.” After we finished writing our stories we had the opportunity to share with the person next to us. It was a very inspiring day and I’m going to tell you what Jerry hoped each of us would do going forward: Be an advocate for writing down our stories! Everyone has their own personal stories and he believes these are getting lost in the swirl of email and the internet. Even if you only share the stories with family and don’t try to publish a memoir, that’s perfectly fine. The important part is to just start writing! If you have interest in learning more about writing your own personal stories, I highly encourage you attend one of Jerry’s workshops. You can see his event schedule on his website. Living in a drafty farm house made for some interesting cold winter days and overly warm days in the summer. I remember spending hours huddled under blankets in the family room during the winter and opening every window in the summer hoping for a breeze. This was the room I spent the most time in since my Dad always took over the living room watching sports on TV (old games and new). One day we decided to have a spit ball war in the family room. My brothers, sister, nephews, brother’s friend, and I set up forts across the large room. We used poles from a play tent to launch the toilet paper spit balls across to our enemies. My poor little nephew Damon (who was about two) got caught in the middle of this spit ball war. Two year olds don’t always follow directions well. So, he would pop out at the worst times. It always brings a smile to my face because we used what we could find to create our own game. I still can’t remember who cleaned that yucky mess up when we were finished. Maybe it was my poor mother. One of her many benefits of having four kids! When I turned ten years old I received what I thought was the best present ever. It was a bright blue bicycle. To that point I had the same bike that had been passed down from my older brothers a few years earlier. I had asked my parents months before about getting a new bike but thought they had forgotten about it. I had a sense that since we were in a new house they had built that maybe a new bike was out of the question. But I was stunned on my birthday when Mom and Dad took me into the living room where my new bike was waiting, with a big bow on the handlebars. I have a picture taken of me shortly afterward – a wide-eyed kid with a huge smile. You can bet your last dollar that I rode that bike everywhere. I have an October birthday, so after I got the bike I didn’t have much time to ride it before winter came. But I made the most out of the time I did have! Over the next five years until Dad bought me a ten speed at a garage sale, that blue bike took me many places – to friend’s houses, to the neighbors, fishing, and on longer rides to towns such as Mt. Horeb and New Glarus. I don’t think my parents realized that giving me the bike was like giving me a companion. We also attended one of Jerry’s author events last fall. You can read my post about that event here. The go-to guide for storytellers! This is so interesting, I wish I had paid more attention to my “social” page. I might have gone. I think you really would have liked the workshop. He’s really engaging and inspiring. I’ll let you know if I see another workshop scheduled…but you have to sign up right away. They had a waiting list!